Pulp Cthulhu: Reckless Adventures in the 1930’s jumps into the decade of pulp adventure! Enter a time when the world changes. Economic despair brings a nation low, while an eldritch shift in the fabric of reality unleashes dark horrors, and tempts heroes. Join in as secret societies and occult leagues battle against horrific creatures in a timeless struggle for existence. 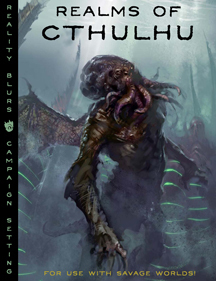 Pulp Cthulhu expands upon the Call of Cthulhu setting and rules system, allowing for fast-paced, cinematic game play. It provides rules for insane scientists, reanimators, mentalists, gadgeteers, professor-sorcerers, supernatural detectives and much more. Tune the level of pulp to suit play, or simply add pulp to an existing Call of Cthulhu campaign. Get into the fight! Battle cosmic horrors for the future of the humanity. Pulp Cthulhu verzögert sich seit Jahren immer wieder aufs Neue. Manche munkeln – und nicht erst seit gestern -, es wäre Vaporware. Mit der Weitergabe des Projekts an William Jones sah es kurz so aus, als würde sich doch etwas tun, aber auch das scheint nicht zu klappen. Schade, aber ich glaube erst an das Buch, wenn es im Regal steht.